The July 2012 global temperature analysis, posted this morning by the National Climatic Data Center (NCDC), shows that the combined land and ocean temperature was the 4th warmest on record. The Northern Hemisphere land temperature was the warmest on record for July. As was the case in May, all 12 of the Julys since 2001 have been in the top 14 warmest on record. 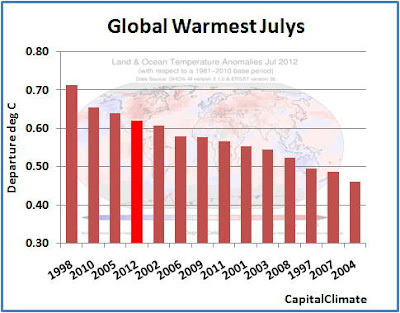 The globally-averaged land surface temperature for July 2012 was the third warmest July on record, at 0.92°C (1.66°F) above average. The Northern Hemisphere land surface temperature for July 2012 was the all-time warmest July on record, at 1.19°C (2.14°F) above average. The combined global land and ocean average surface temperature for January–July 2012 was the 10th warmest such period on record, at 0.53°C (0.95°F) above the 20th century average. Self-designated climate expert Richard Muller appeared on the Diane Rehm show on NPR this morning, along with Juliet Eilperin, a shark book author and occasional environment reporter, and Michael MacCracken, chief scientist at the Climate Institute. Although apparently now convinced of 1980s-level climate science, Muller kept spinning the story as a political issue, almost immediately casting it as a Republican vs. Democrat story (i.e., Republicans were "more aware" of the "terrible quality" of the temperature record). August 14 Update: The preliminary National Climatic Data Center analysis shows that the U.S. national average temperature was 1.9° above normal in the past week, with the month-to-date average 1.7° above. 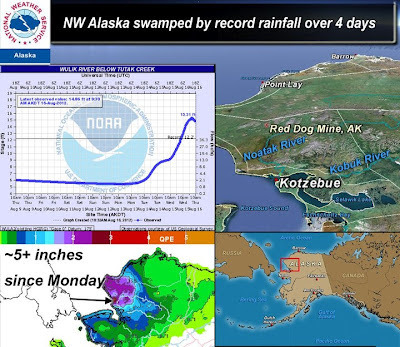 For the first time in 10 weeks, the East North-Central region was below average at -1.0°. 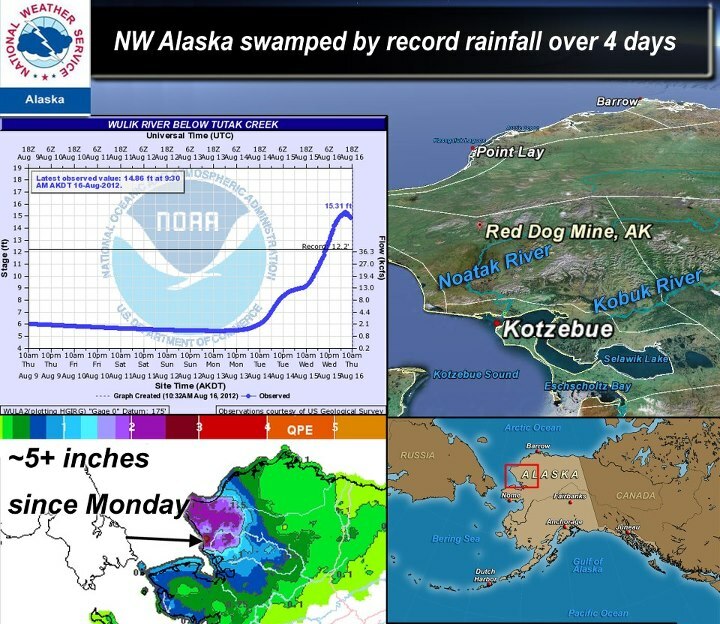 CapitalClimate analysis of preliminary reports from 215 National Weather Service stations across the 48 contiguous states shows that the unadjusted U.S. national average temperature was 1.4° above climatological normal for the week ending yesterday, August 11. 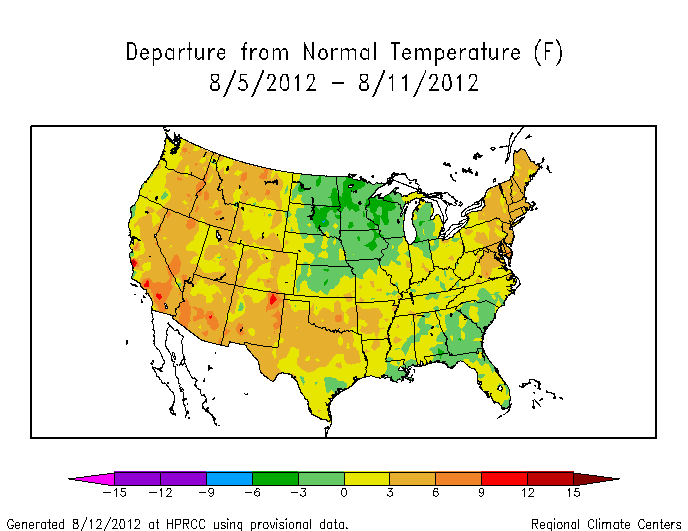 Thanks to some cooling in the Midwest and Southeast, this was down somewhat from the record 3.3° for the month of July. 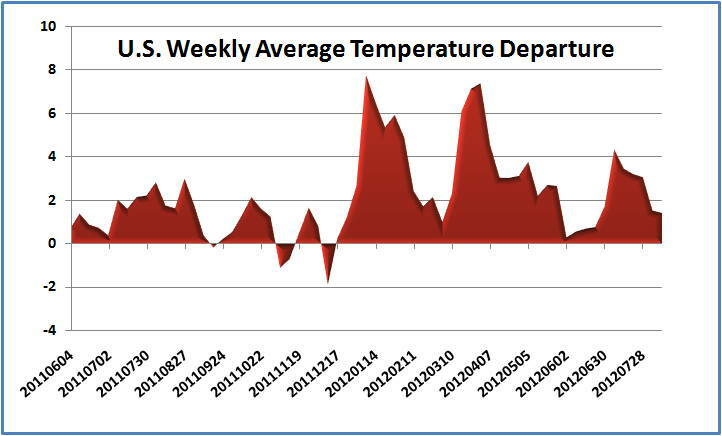 However, the past 2 weeks are the 34th and 35th consecutive weeks of above-average temperatures. 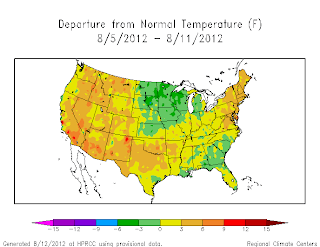 With August now one-third over, every single week so far in 2012 has been warmer than climatology. The last cool week ended 8 months ago, on December 10. Of the 215 locations, 63% were above average, vs. 88% the previous week. All of the 9 National Climatic Data Center climate regions have been warmer than average for each of the 5 weeks through August 4.